Paragon NTFS for Mac is a tool that helps you to write, edit, copy and delete files on Microsoft NTFS-formatted drives connected to your Mac. Paragon NTFS application installs its pane to System Preferences, so it is not enough to drop the app to Trash to remove it correctly. There are three possible ways to remove Paragon NTFS from Mac. 15 minutes to complete, you should manually remove all it’s service files. Fast to remove, but some service files would be left behind. Fast to uninstall, ultimate removal. 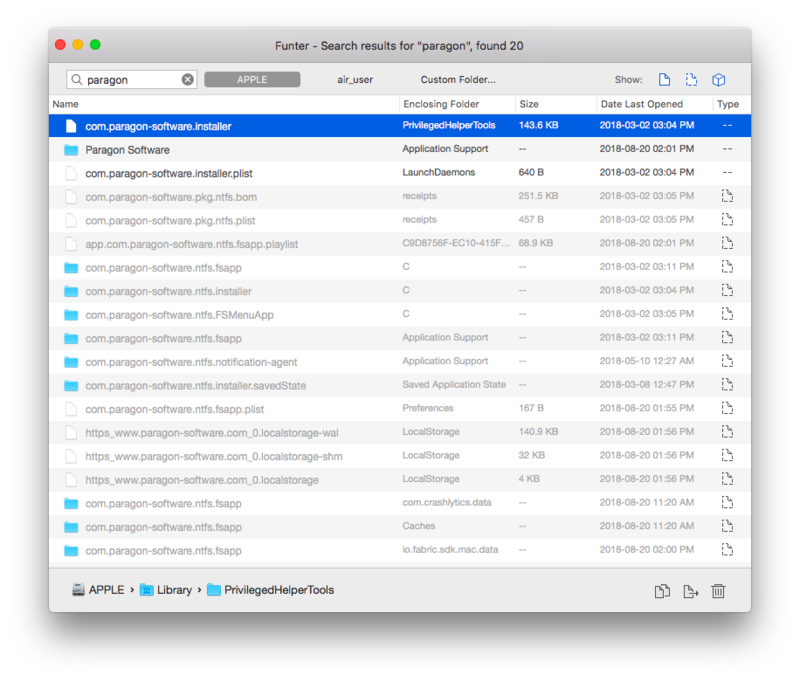 Like most Mac users do, you may delete Paragon NTFS following these steps: go to the Applications folder in Finder → find Paragon NTFS for Mac 15.app → make a right-click and select Move to Trash → then, Empty Trash. However, advanced users know that any application creates service files for its proper work on a Mac. Likely, you have heard or read about caches and logs. These types, in addition to other files, are the temporary helpers of an application. So, the deletion of the .app file is not enough for the application’s entire removal from your Mac. Furthermore, the temporary service files are useless without the application on your Mac. So you have to find all the leftovers of Paragon NTFS and remove them. Click Go in the toolbar and select Go to Folder in the drop-down menu. Type ~/Library in the appeared window and click Go. Type paragon in the search field in the corner of the window and hit Enter. Next, you will see all the files and folders that relate to Paragon NTFS. Select these items, move them to the Trash, and then empty the Trash. You should also check your Mac’s System Preferences. Some applications create a System Preference pane (an application icon) on your Mac by default. Paragon NTFS is one of them. 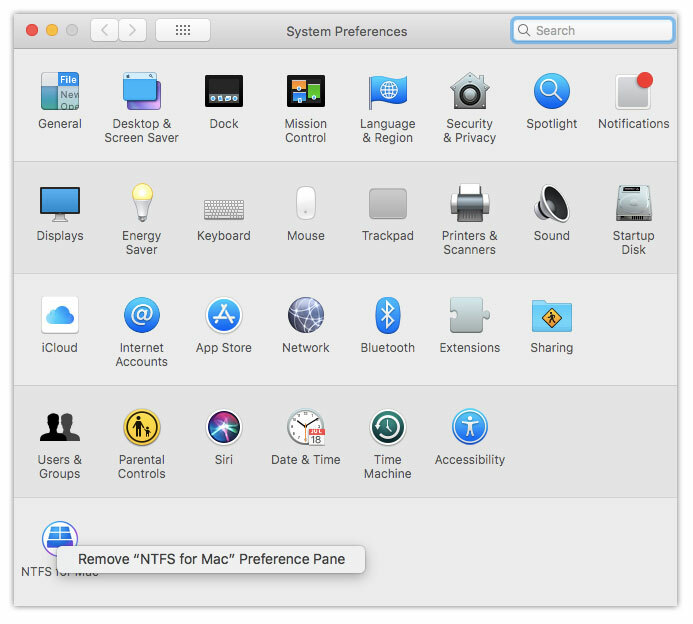 So, open System Preferences → find Paragon NTFS for Mac icon → make a right-click and Remove “NTFS for Mac” Preference Pane. Then you should navigate and remove Paragon NTFS cache files stored in ~/Library/Caches, application support files, crash reports, preferences files, remove them as well. More experienced users also know that some applications have an uninstall driver which goes together with an installer driver on the DMG file (installation Disk Image). 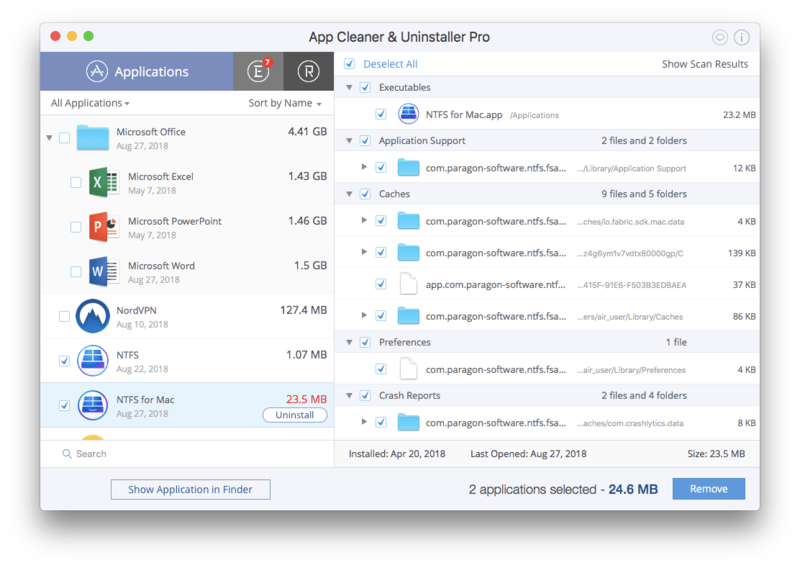 You can use Paragon NTFS uninstaller* to remove this app from your Mac. *This removal method leaves behind service files, making them occupy disk space. 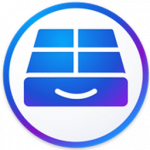 Launch Paragon NTFS for Mac. On the application’s menu bar select Preferences. In the General tab of the Preferences window click on the Uninstall button. Or alternatively, run Paragon NTFS for Mac installer (ntfsmac15_trial.dmg) and select Uninstall Paragon NTFS for Mac 15. But even if an information window “Product uninstalled successfully” appears, it does not indicate a complete removal. Therefore, if you wish to check whether there are any leftovers of the recently-deleted application on your Mac, try Funter. It is a useful tool, that shows you all files and folders related to the search object, including hidden items. 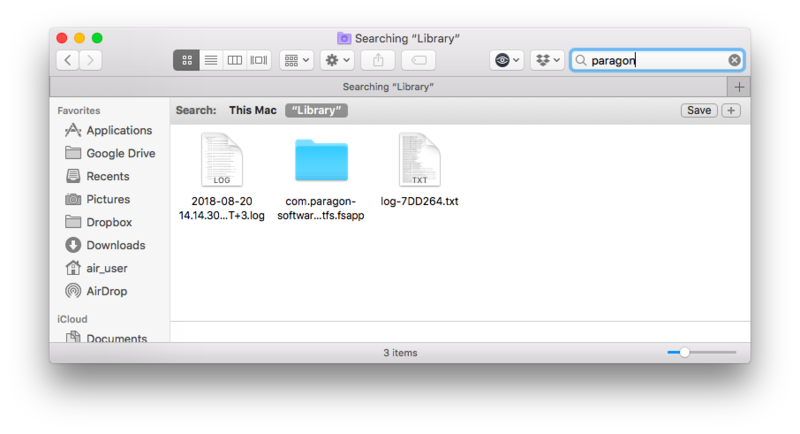 So as soon as we deleted Paragon NTFS for Mac via its uninstaller, we launched Funter and typed “paragon” in the search field. Funter found 20 items related to Paragon, that were left on a Mac. You can see it’s own uninstaller is not a complete solution. Again, you can delete these files manually one after one. But we know of a special software, which can uninstall an application and all its related files and folders at once. 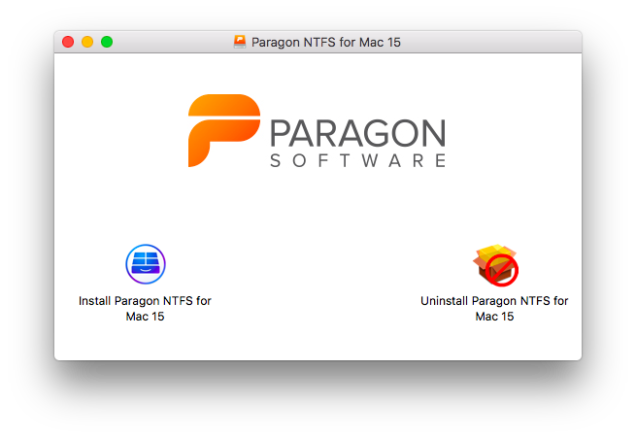 Select Paragon NTFS for Mac 15 from the list of applications and click Uninstall next to the app. Overview the items you are going to delete and click on the Remove button. Empty the Trash bin to get rid of the application and its service files completely. These three methods of uninstalling applications are widely-used. However, the first two methods leave leftover files from the apps. Unfortunately, these useless service files may account to gigabytes of junk on your Mac over time. In case you want to keep your Mac in good condition, clear it from the junk files regularly. Use App Cleaner to completely uninstall Paragon NTFS from your Mac.